It’s the end of an era for our lab, as we recently said farewell to our resident zebrafish guru and all-around amazing person Anita Racz. Anita has been an invaluable member of our team and we will miss her tremendously now that she has headed back to her native Hungary. We wish her all the best and look forward to working together in the future whenever possible! It was an anime-themed goodbye party for Anita, so the spikey anime hair was in full effect! Just a few of Anita’s farwell gifts! This week Davide and Shaun headed to the International Congress on the Biology of Fishes. 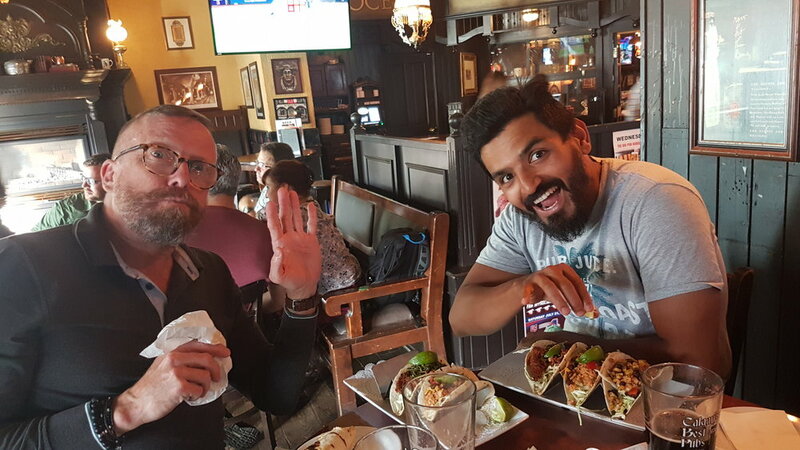 It was a week full of fantastic talks and meetups with great friends. Extremely blurry photo of Shaun talking about digestive costs and positioning of fish within schools. David McKenzie talking about our work on air-breathing fish in Brazil. 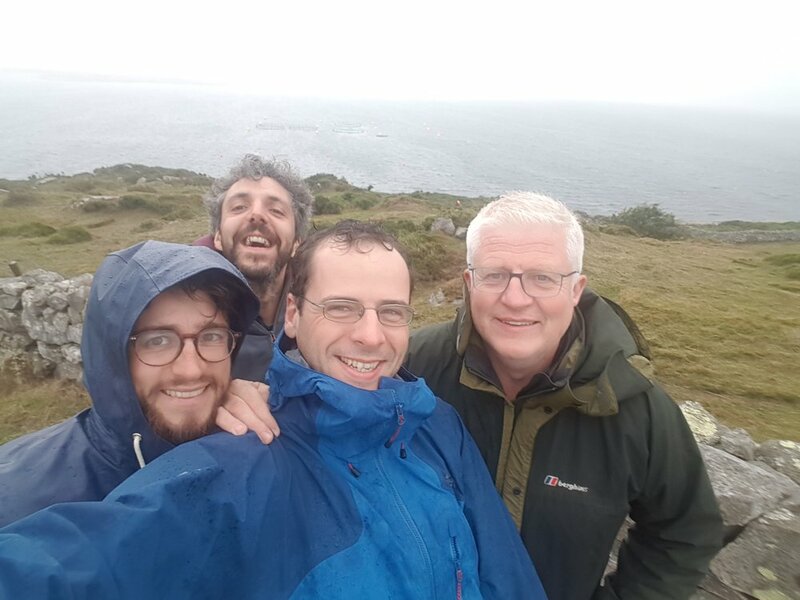 This week Shaun travelled to Ireland to meet with friends and colleagues Christos Ioannou, Phil McGinnity, and Valentin Lecheval, to perform work on some ongoing projects. The weather wasn’t very cooperative but it was a productive and fun trip nonetheless! This summer, Barbara, Magdalene, Jack and Shaun went to the North Sea Oceanarium in Denmark to run an ”upscaled” fishing experiment on Atlantic Cod. This work was done together with colleagues Junita Karlsen and Peter Skov from DTU, the Danish Technical University, and Albin Gräns and Per Hejlmstedt from SLU, the Swedish Agricultural University. Part of the ERC PHYSFISH-project, this experiment aims to investigate why certain fish within species might be more vulnerable to capture by fishing than others and if this is because they differ in behavior, metabolism, or stress response. Before running fishing simulations, using trapping and angling, all fish where implanted with loggers continuously recording their heart-rate and then measured for their behavioural traits and metabolism. 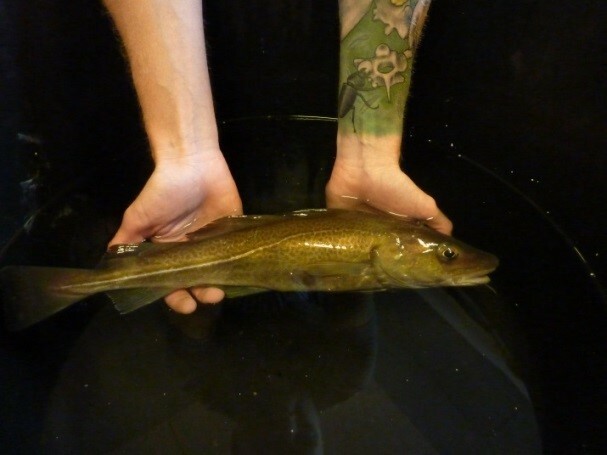 Atlantic cod after being implanted with a heart rate logger. Big fish, big experimental arena! Some of the team posing in front of the big pelagic aquarium. Thanks to the staff at the North Sea Oceanarium for making this possible and to all for this great collaboration! 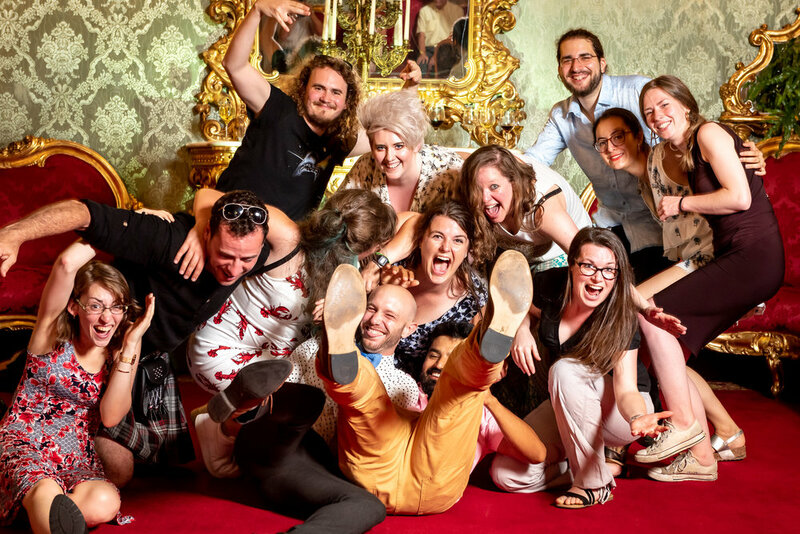 Earlier this month several members of the lab converged on Florence, Italy, for the annual meeting of the Society for Experimental Biology. As always with the SEB, it was an incredibly fun conference packed with amazing and inspiring talks. Lucy Cotgrove talking about the effects of metabolism and temperature on behaviour of fish schools. Marion Claireaux discussing the work she did in our lab on how metabolism affects group behaviour and how this varies with group size. Jolle Jolles talking about the integration of physiology and behaviour in the study of collective animal behaviour. Davide Thambithurai talking about how hypoxia may affect capture vulnerability in fish. Daphne Cortese on how female size affects offspring quality in clownfish around Moorea. Jack Hollins discusses his work looking at how temperature affects vulnerability to capture in fish and links with metabolic traits. Julie Nati talking about how variation in thermal sensitivity within species varies with latitude. Marie Levet with her poster on how boat noise affects fish metabolic rate. Mustafa Soganci with his poster on how hypoxia affects fish schooling behaviour. Anna Persson presenting her poster on her honours project which looked at diurnal variation in coral reef fish. Steph McLean presenting her poster on how digestive costs affect schooling behaviour in fish. Luca Pettinau presenting his poster on how metabolic rates affects assortment within fish schools. Off all the bars in Florence, of course we find the one Scottish pub. Hi-jinks at the conference banquet. At the Euro Evo Devo conference in Galway, Ireland (26-29 of June), Tiff gave an oral presentation on how maternal mouthbrooding contributes to the development of craniofacial shape in four species of African cichlids. Despite some technical difficulties (her talk got lost! ), and some intense heat, the talk went over well and she received some useful suggestions for future analysis. Every year the Glasgow Science Festival is an amazing opportunity for our group and other scientists to engage with thousands of members of the public through a huge number of events across the city. Monumental is one such event, 'which aims is to introduce women in science from the past and present times' to the public to celebrates inspirational Women in STEM. This year our zebrafish guru Anita had the chance to participate in this amazing activity and share our fisheries-induced evolution research project with a public audience. Anita had a great time showing and explaining the aim of the project through the use of miniature fishing gears and fish models to children and parents interested about science. Children were fascinated with the different fishing gears and fishes, especially "why and how the fishes get into those"? The audience liked the visible mini models which were presented together with pictures of experimental designs and pictures of real fishes. The combination of these tools helped with explanations of how we use these in research scenarios. Anita had an enjoyable time and learned a lot through this public engagement activity. Our group is always looking for similar opportunities to reach the broader audience and we love sharing our research! This week Lucy and Shaun visited Jolle Jolles in Konstanz to work on various ongoing analyses. It was a great few days with lots of excellent brainstorming and exchanges of ideas. Looking forward to our next visit! Last week Shaun was in Bergen, Norway, for a meeting of collaborators and consultants on the ConEvolHer Project, coordinated by Katja Enberg. It was an incredibly stimulating week of science with some fantastic people. Thank you Katja and lab for organising such a great meeting! For the second year in a row Shaun and Tommy went to the CRIOBE research station on the island of Moorea to work with Suzie Mills, Ricardo Beldade, and PhD student Daphne Cortese. This time they were also accompanied by Amelie Crespel. Once again the goal was to carryout a range of studies looking at how factors such as flow rate and anenome bleaching affect young clownfish. Thanks to all for an incredibly fun and productive trip! Arriving by ferry in Moorea with equipment in tow. Amelie and Daphne setting up respirometry chambers. Measuring oxygen uptake in juvenile clownfish being exposed to bleached anenomes. A juvenile clownfish in a swim tunnel. Project Summary – Atlantic salmon are an iconic species that are ecologically and economically of great importance. This project will study the collective behaviour of migrating Atlantic salmon using a combination of field studies, mathematical modelling and data analysis. The project will evaluate whether collective behaviour has positive consequences on the fecundity and survival of Atlantic salmon and enables them to more effectively navigate their environment. Whether this creates tipping points in population abundance will be assessed by examining the potential for feedbacks among population size, group sizes and group function. The ultimate goal is to develop a mechanistic framework to predict the impact of altered habitats on the migration and population dynamics of Atlantic salmon in Scotland. How does group size affect navigational accuracy? Field work will be performed using an array of acoustic receivers to allow imaging of the migration of varying numbers of returning Atlantic salmon and investigation of how group decision-making impacts migration routes. How does group size influence ability to navigate novel challenges? The student will examine whether social behaviour alters the ability of salmon to cross human introduced barriers such as fish ladders or fishing traps. Will fishing strategies target certain types of individual and lead to evolutionary responses that may impact the migration? Computer simulations will utilize known patterns of fish movement in groups to examine how salmon respond to barriers and deployed passive fishing gears, and whether this will result in novel selection pressure on the species. How does collective movement influence population dynamics of Atlantic salmon? Informed by the results of the behavioural studies the final stage of the project will develop spatial metapopulation models that incorporate a feedback between population size and the ability of groups to navigate. Project Team and where student will be based – The student will be co-supervised by Colin Torney (School of Mathematics and Statistics), Shaun Killen (Institute of Biodiversity, Animal Health, and Comparative Medicine [IBAHCM]), and Colin Adams (IBAHCM). When not performing fieldwork, the student will be based either in the Mathematics building or Graham Kerr building, depending on the type of analysis being carried out at a given time. Application Process - In the first instance prospective applicants should contact Colin Torney, colin.torney@glasgow.ac.uk to discuss your eligibility. Applicants may submit applications here up until the application deadline of February 16 2018. This month our lab extends a warm welcome to Lucy Cotgrove, who will be doing a PhD studying context-dependent leadership in collective behaviour, focusing on fish behaviour in a project co-supervised by Grant Hopcraft, Colin Torney and Dirk Husmeier. Lucy has broad interests including population ecology and how this varies under different pressures. In the long term, she aims to look at how how her interests can be used to implement conservation methods leading to improving sustainable seafood practices. Lucy completed her MSc in Marine Biology at Bangor University, Wales where she worked with IMEDEA, Mallorca, exploring the effect of anthropogenically altered water masses on juvenile fish behaviour. Before moving to Glasgow, Lucy worked as a hatchery technician and has been involved in a project with Cefas, exploring population distribution of vulnerable elasmobranchs in the UK. Highly coordinated movement in social animals raises questions about how collective decisions are made and leadership roles. For example, a bait-ball of fish responding to predator attacks is likely a product of each individual balancing the information about their immediate environment (predator versus no predator) that is nested within a matrix of information from neighbours whose perception is be beyond that of the focal animal. This balanced but hierarchical information structure could lead to coordinated reactionary swarms. In reality, however, these swarms also navigate and problem solve as they move through complex environments. Coordinated navigation suggests that a group of naïve organisms may actually make intelligent and informed decisions about where and when to move via some form of consensus that may be governed by rules of social influence. This poses interesting questions that relate to complexity science, information and communication, and the statistical inference and applied probability in biological informatics. For instance; are small groups equally efficient at navigating complex habitats as large groups? Are multi-species groups better than single species swarms? Does the mantle of leadership change between individuals based on the type of decision required such that different individuals are more decisive under certain scenarios (e.g. some individuals in the group make the left-right decisions, while others are decisive in fight-flight)? Do leaders always assume certain positions in the group, such as core vs peripheral, and are there specific locations where they are most effectual? We propose a PhD project that uses hours of aerial drone videography of wildebeest and zebra migrations in the Serengeti in which the movement of hundreds individuals can be tracked at once using image recognition algorithms (Dr. Hopcraft [IBAHCM] & Dr Torney [Maths]). The detailed analysis of this footage using equation-free modelling techniques will illustrate how movement decisions vary across scales and under a variety of natural conditions these animals face (navigating river crossings, moving through risky habitats, etc). The student will then use schools of aquaria fish (Dr. Killen [IBAHCM]) to experimentally manipulate groups to test ideas about how group size, conspecific characteristics, and relative position alter the roles of leadership and the ability to navigate complex environments. The application of equation-free modelling will train the student in multiscale computation and computer-aided analysis that is particularly informative when the evolution of an emergent property of the system is observed at a macroscopic scale (such as collective decisions by groups), but is dependent on explicit dynamical models that operate at a more detailed fine-scale (individual decisions operating at short time steps). Understanding the mathematics of how natural systems optimize information transfer and group size provides a fertile environment for a PhD student to explore analogous applications in swarm robotics and sensor technology as well as crowd control and emergency evacuations (Dr Torney and Dr Husmeier). For more info on how to apply, click here! This week several members of the lab traveled to Gothenburg, Sweden, to present their work at the annual meeting of the Society for Experimental Biology. It was also a chance to catch up with old friends and colleagues from around the global research community as well as explore some of the sites and pubs of Gothenburg! On Day 1 of the conference Shaun Killen chaired a session along with Carol Bucking (York University, Canada) on Constraints on Adaptation and Performance. It was a fantastic, well-attended session with talks spanning all major animal taxa. Also on this day Shaun gave the President's Medal Address for the Animal Section of the SEB (click here for a PDF version of the talk slides). 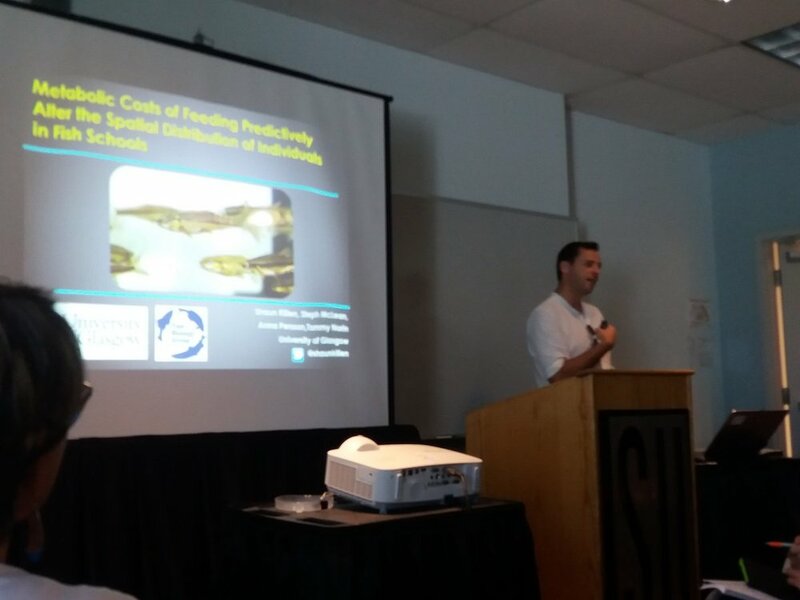 Tommy Norin also gave a fantastic talk on day 1 summarizing his work with Neil Metcalfe, looking at how environmental factors influence behavioural and physiological plasticity in minnows. Giving the President's Medal Address with a Madonna-style headset. On Day 2 Shaun Killen chaired another session, co-organised by Lewis Halsey (University of Roehampton), which explored the idea of whether or not wild animals engage in exercise and the costs of physical activity. In the evening Tiff Armstrong presented her poster on her recent collaborative work in Texas with Andrew Esbaugh examining the effects of crude oil exposure on shoaling behaviour in Atlantic croaker. Tommy Norin also presented two posters showing collaborative work among himself, Shaun Killen, and colleagues at CRIOBE in Moorea, Tahiti. SEB poster session... can you spot Tommy Norin? Day 3 was a busy one with Julie Nati giving an excellent talk (slides here) on her recent Biology Letters paper showing that there is no trade-off between peak performance and performance breadth for aerobic scope across temperatures for fishes. Shaun Killen also chaired the ecophysiology section of the Open Biology session. Anna Persson and Amelie Crespel also gave Pecha Kucha talks promoting their posters. The poster session was later that evening where Davide Thambithurai and Mar Yerli Pineda also presented their work. Julie Nati wowing the crowd. Amelie Crespel promoting her poster. Day 4 was a bit more quiet. During the awards ceremony Shaun Killen received the Animal Section President's Medal. In the evening in was time to party at the traditional SEB banquet! 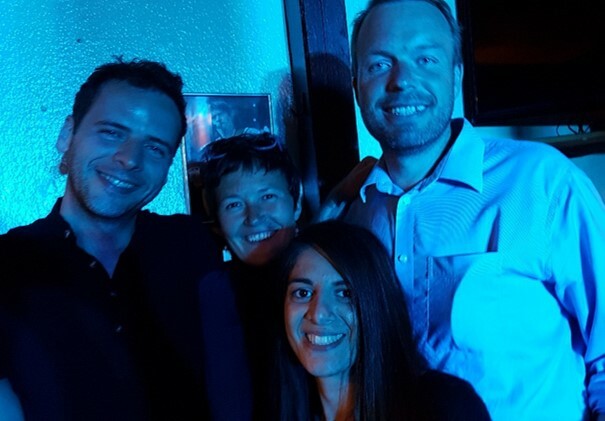 This week Anita Racz traveled to here native Hungary to attend the 10th Annual European Zebrafish Meeting. There she presented her poster on a project carried out by herself and Toni Dwyer examining the effectiveness of various disinfectant methods for zebrafish eggs. Well done Anita! Killen, S.S., Marras, S., Nadler, L.E., Domenici, P. 2017. The role of physiological traits in assortment among and within fish shoals. Philosophical Transactions of the Royal Society. 372: 20160236.